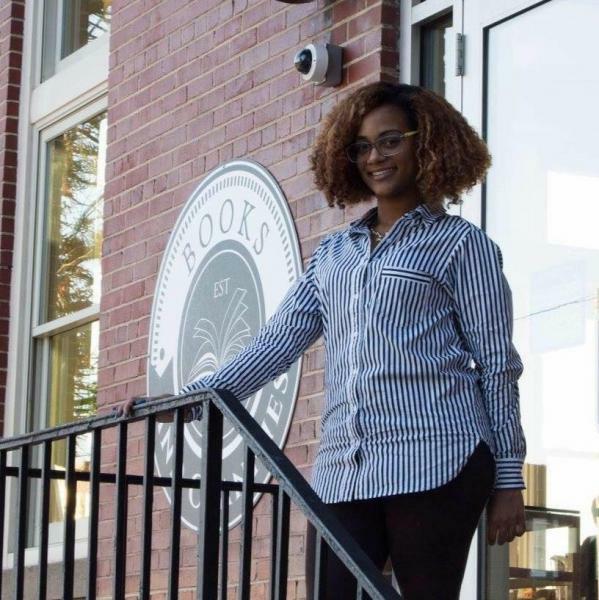 DeShanta Hairston, the owner of Books and Crannies, is a graduate from Old Dominion University with a Bachelor's of Science in Professional Writing. She was a recipient of the 2016 Startup Martinsville program where she won over $12,000 to open her own business. With a strong passion for reading since childhood, she spent many days after school at Waldenbooks in the mall before they closed down just after she graduated high school. She has always felt a strong connection to books and enjoys the feeling of shopping in person rather than online. She saw a need for the community to be able to leisurely browse for their next selection as she had done as a kid. Reading is by far DeShanta's favorite hobby but she also has a strong love for writing, fashion, and music. She is the mother of 11 year old Treylan who is ranked 6th in the nation for best basketball players in Class of 2026. Her one-year-old, Marleigh, is with mommy at the bookstore daily. DeShanta is a positive, motivating young woman who aspires to help kids like her son develop a love for reading as she had growing up. In her spare time, you can often find DeShanta reading, attending her son's sporting events, binge watching her favorite shows, or stuffing her face with food. Although she was afraid of animals growing up, she has since developed a keen love for dogs through her boyfriend who breeds English bulldogs and American bullies; however, she is unfortunately forever terrified of cats. Books and Crannies is an independent bookstore which opened on September 20, 2016. With the closing of all major book retailers in this area, Books and Crannies has opened a new market in Uptown Martinsville that was at the time unfulfilled. We are a general interest/literary bookstore featuring fiction and non-fiction accompanied by a selection of children's books and a wide range of titles. We have the ability to order any books still in publication. We also have a used book section featuring $1 paperbacks and $3 hardbacks. Within the store, self served coffee is available via a Keurig and complimentary water is offered. Books and Crannies hosts a variety of events throughout the year such as children's readings, open mic poetry, and book signings featuring local and regional authors. Books and Crannies is an advocate for those who love literature and believe we play an important role in our community. We hope to continue engaging with the community by bringing new ideas and activities to the area to help expand the minds of the citizens through a shared love for literature for many years to come. PLEASE NOTE: If you come by during normal business hours and we are not open, please bear with us. I am the sole operator of this establishment and may have to close early or open late occasionally to accommodate my children's needs. Bringing Marleigh to work every day and attending as many of Trey's basketball tournaments/school events as possible are just two of the perks of having this store. However, I often have to make sacrifices between being present at the store and being present as a mom. I love all my customers dearly and find joy in serving the community, so please don't give up on me if I happen to miss you! Books and Crannies needs you guys to survive and I still wholeheartedly believe our community needs a bookstore to thrive!